Comin’ atcha on a Wednesday again and it feels good to be back to my old posting schedule! If read my last post, you might have seen my little note at the end about going back to MWF. I don’t really have a big reason other than I just miss the old schedule. I hope that’s ok with you guys! Anyway, today I wanted to share how to paint the inside of a fireplace. 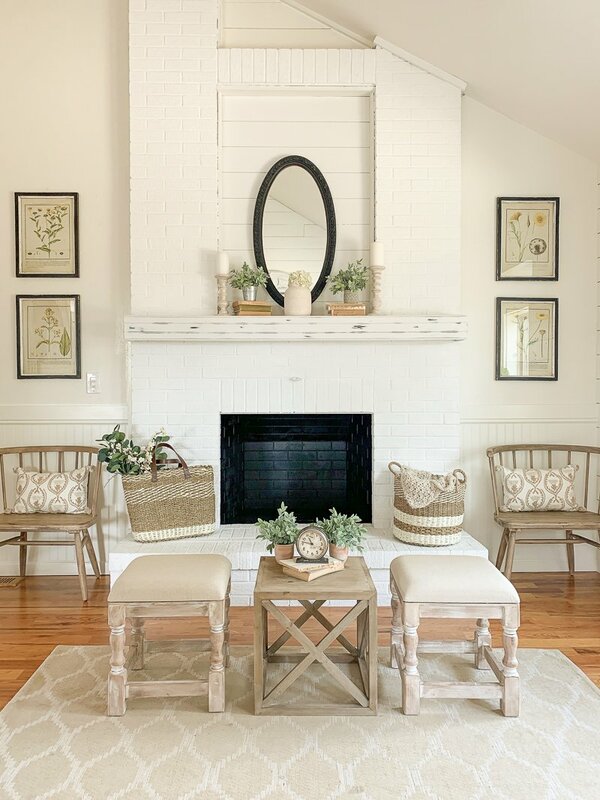 I actually did this a few weeks ago as part of our little fireplace makeover and I seriously LOVE how it turned out. It was super duper easy and fast, which makes me wish I had done this years ago. But like I always say, better late than never, right? Right. Ok, let me show you how it looked before the paint. Super dingy, right? It certainly wasn’t the prettiest thing, so I actually made a little DIY curtain to cover it a few years ago. (I shared how I did that in this post if you’re interested.) That was great for a while, but I was getting tired of the curtain and wanted a cleaner look. So I grabbed my paint and got to work. 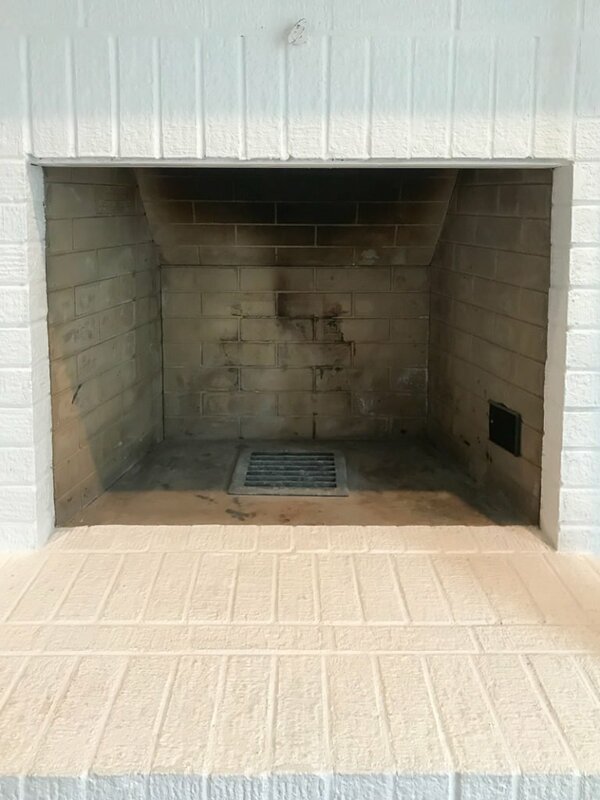 I did some research before I started this project and I found that you need a high heat paint to do a fireplace box. We actually don’t even use our fireplace in the front room, but I still wanted to go that route in case we ever do. 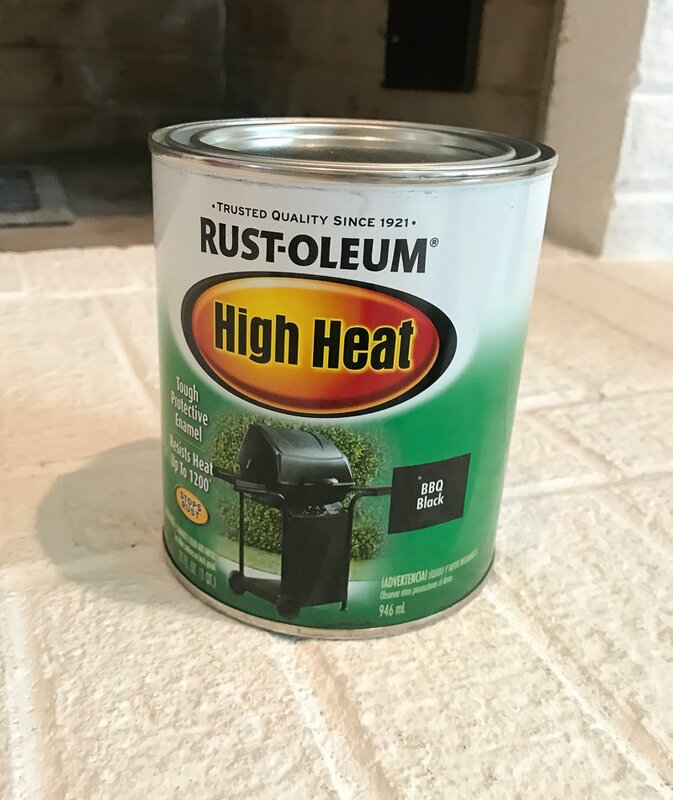 Anyway, I bought Rust-Oleum High Heat paint in black and got to work. To start I vacuumed out all the dust, cobwebs, dirt, etc. That sucker was actually pretty dirty, so I also used a hot soapy rag to wipe everything down really well. I wanted the brick to be as clean as possible before I started painted. Once I had everything clean and tidy I got to painting. I used a roller to apply the paint to the brick and that made the job super fast. I simply rolled it on and used a small brush for the tight areas. I only needed one coat of paint to get great coverage. Although I will say that this stuff STINKS. It has a very strong odor, similar to a stain, so I definitely recommend using a mask and opening the windows. Ok, here’s how it looks now! So much better now, huh? I was actually surprised at how easy the whole process was and I wish I had done this sooner. I think the finished look is so clean and classic. It’s makes the whole fireplace look better! This is the kind of project I love doing–fast, easy, and instant results. The whole thing took maybe 45 minutes and I just can’t get over the difference. Even my husband mentioned how much better it looks now. 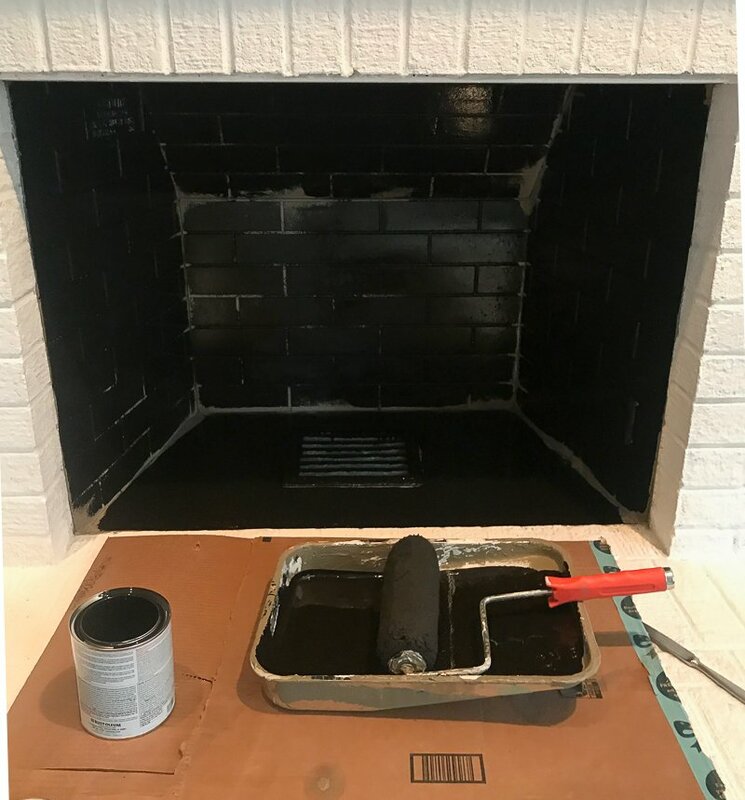 And who knew painting the inside of a fireplace would be so darn easy?! I should have done this a long time ago, but at least it’s done now. Also–can we just talk about those cute benches? I picked them up from Hobby Lobby yesterday and they were on clearance. Cue the happy dance!! Yes! Been waiting to hear about how you did it! Perfect! I’m off to it now! 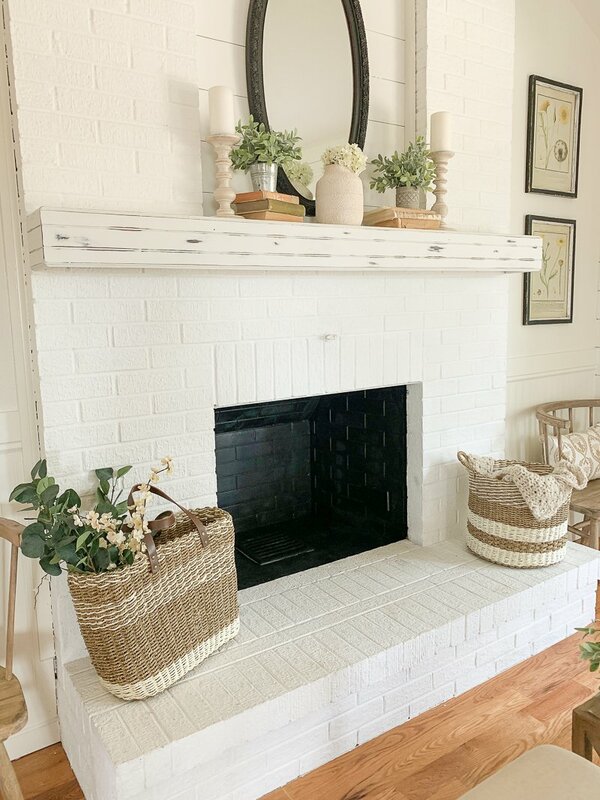 I have been wanting to paint my fireplace inside and out forever, thanks for sharing how to do it. 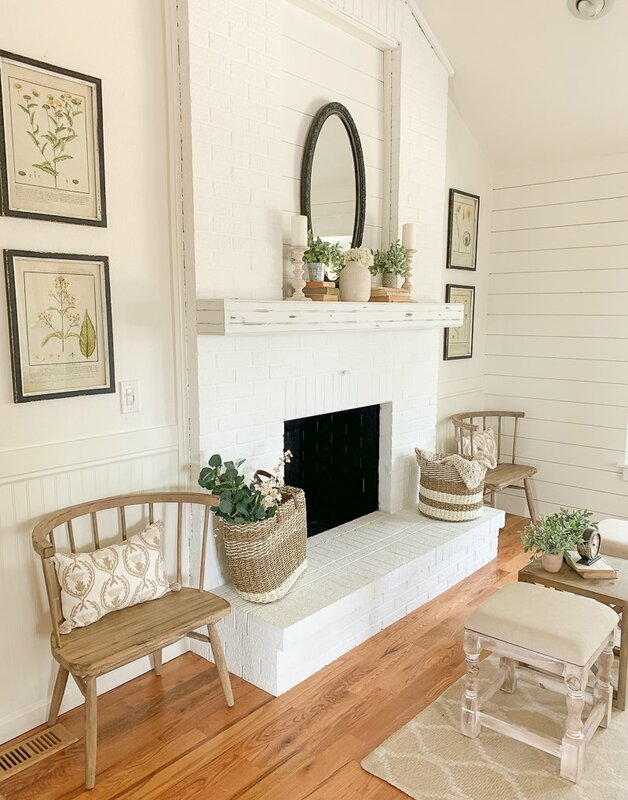 Do you have a post on how you painted the fireplace brick on the outside? I need to get that done too! Yay Sarah, I’m so glad you went back to the M, W, F schedule! 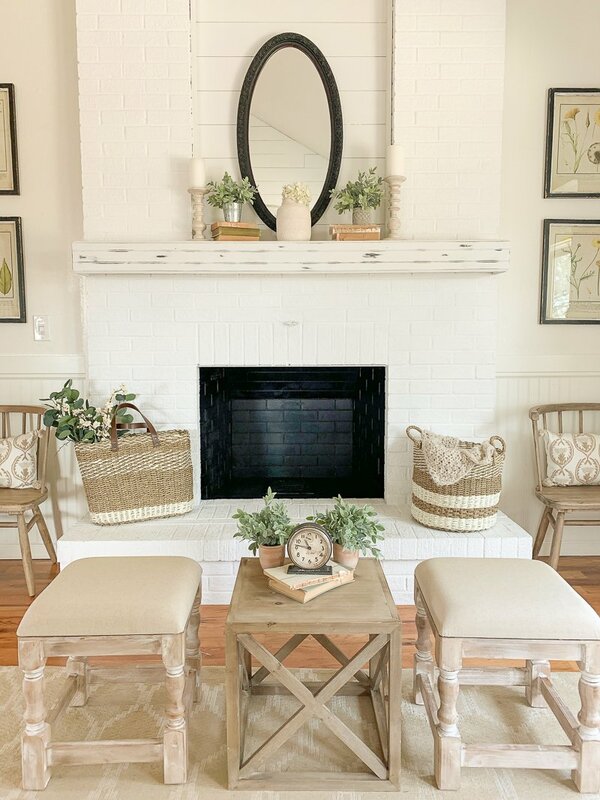 As for the fireplace, what a HUGE difference that made…I absolutely love it!!! thanks Andrea, I’m glad to be back in the old schedule too!! Love it! So fresh and looks like new! Looks much cleaner and nicer. 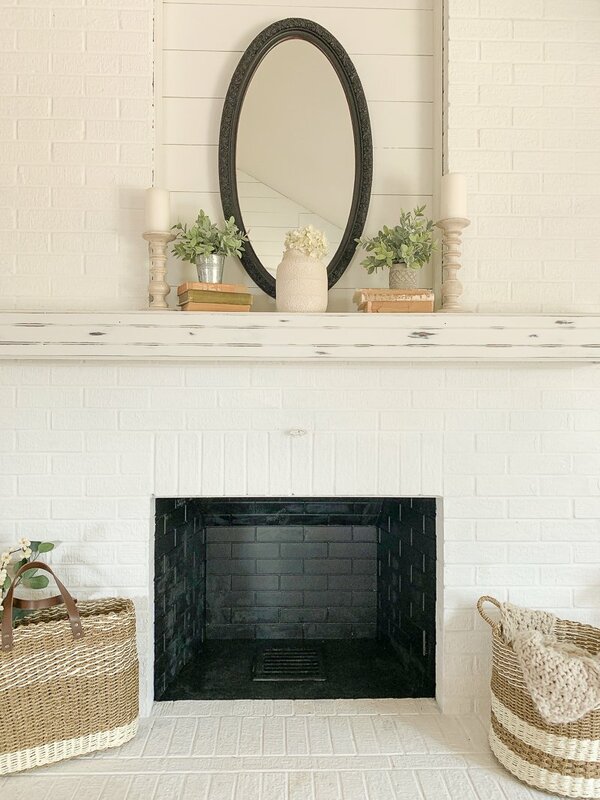 I painted my fireplace black also in my previous home. Was a job but the outcome was worth it. The fireplace, inside and out look amazing. Thank you for the tip I am totally doing this. The benches and table look fab. Wow, what a difference! A stack of birch logs or an iron candleholder with flameless battery candles (they even have some with remote controls!) would be really pretty if you wanted to add something to the space😊or even a basket of greenery. That looks so good! I would have never thought I could do something like this. So cool! I have the stuco ugly bullnose mantel ugly pinkish tile and want to do everything. Going to paint the inside ,yours is beautiful. Any ideas for the rest of it? That’s budget friendly pls? Thank you. Love your benches too!!! You’re right, Janella. 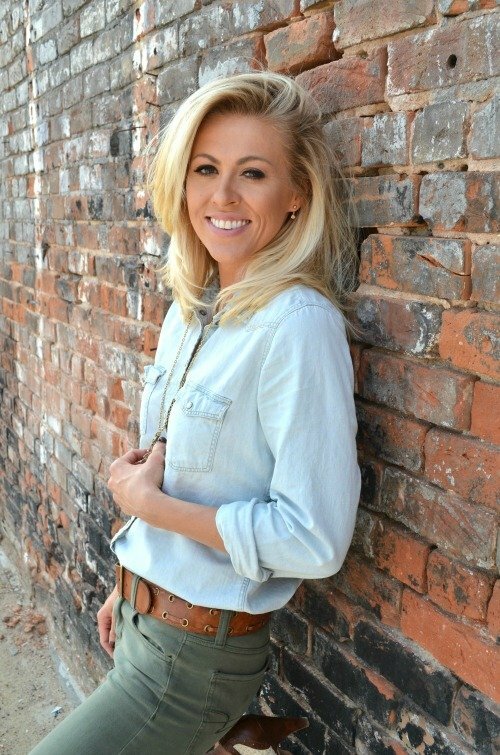 So easy peasy and quick–my favorite kind of project! LOVE it! Thanks so much for posting exactly the project and inspiration I’ve been waiting for. This is absolutely the next DIY on my to do list. oh yay!! Good luck with it Tracey.